The second book in The Mysteries of Nature Trilogy by the New York Times bestselling author of The Hidden Life of Trees, Peter Wohlleben. The third book, The Secret Wisdom of Nature, is coming in Spring 2019. 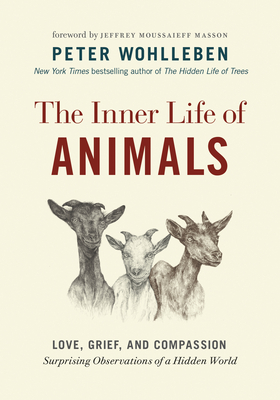 "Like The Hidden Life of Trees, Peter Wohlleben's The Inner Life of Animals will rock your world. Surprising, humbling, and filled with delight, this book shows us that animals think, feel and know in much the same way as we do--and that their lives are, to them, as precious as ours are to us." In this, his latest book, Peter Wohlleben follows the hugely successful The Hidden Life of Trees with insightful stories into the emotions, feelings, and intelligence of animals around us. Animals are different from us in ways that amaze us--and they are also much closer to us than we ever would have thought. Peter Wohlleben is the author of the New York Times bestselling book The Hidden Life of Trees. He is a natural storyteller who writes on ecological themes. He manages a municipally owned, environmentally friendly woodland in Germany. When he is not writing books or caring for his trees, he looks after the family dog and his small collection of farm animals. Jeffrey Moussaieff Masson is the author of numerous books, including the New York Times bestsellers When Elephants Weep and Dogs Never Lie about Love. He is fascinated by the richness of the emotional world of animals and by what animals can teach us about ourselves. Jane Billinghurst's career has been in book publishing in the UK, the US, and Canada, as an editor, publisher, writer, and translator. She is the translator of the international bestseller The Hidden Life of Trees by German forester Peter Wohlleben.